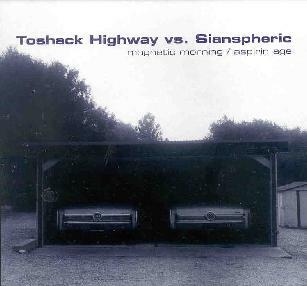 Toshack Highway vs. Sianspheric - "Magnet Morning / Aspiran Age"
Toshack Highway comes out of Canada, and here on this recording they share this double CD with fellow Canadian Band Sianspheric. Each band takes up one CD and offers five tracks. I will start with Toshack Highway. The line up is Jeff Townsin - Drums, Charlie Francis -Bass, and Adam Franklin -Vocals, & Guitar. Their music is a million miles from weird. It walks the indie road with sombre steps, and I can say that I did not like one track, it is too much in the realms of niceness. The songs are done well, the lyrics are sung well, it is played well and all of that, but I cannot get away with it. A friend of mine could only snigger at the name, as he remembered the footballing greats John Toshack and Steve Highway of Liverpool fame. Sadly it was not what we expected. We hoped it was them really, instead we got sad acoustic songs proclaiming meaningless drivel. If I seem to be putting it down that is because I cannot get into it. The songs are not bad and are done well, the musicianship is high, and the production is faultless. The fact is this would have been best reviewed by someone who understands it better. I love folk stuff and acoustic guitar music, but this is nowhere near my taste, even though it is on the main acoustic. It is not in my eyes journey music, rather more instances of subject matter. A song is a song and a journey is a journey, if you know what I mean. This is a collection of songs and they mean something I am sure to those who like melodic acoustic indie styles. I cannot really name many bands who sound like this because I do not listen to bands like this. The promo stuff keeps mentioning Swervedriver so I guess that’s your starting place. Check out their website for better info. After listening to the above I was dubious about the next CD. Sianspheric also come from Canada and are totally different to Toshack Highway as I listen. Their line-up consists of Matt Durrant - Drums, Locksley Taylor - Guitar, Bass and Piano, Sean Ramsey - Vocals, Guitar and Wurlitzer, Paul Sinclair -Vocals and Guitar, and Sarah McEachern plays Trumpet on track 5. In a verses scenario Sianspheric win hands down. Their music is definite floaty journey music in part. The atmospheres created are delayed guitar riffs that work over a backdrop of ambient mellowness on "Beneath the Ocean Floor", they sound a bit like Discolor in a way, I like it because it was instrumental. The music is a sombre march, it drifts around like a dark cloud, and it stirs other more rock pop sounds on "This All Happened". This track sounds like indie music in every way, and again there is that darkness underlying, and again I think it is a hundred percent on Toshack Highway because it has a roughness to it. In the end, I did not particularly like any of them, but if I was to chose I would chose Sianspheric because Toshack Highway bored the kegs off me. For more information you can visit the Sonic Unyon web site at: http://www.sonicunyon.com. Contact via snail mail c/o Sonic Unyon Recording Company; PO Box 57347; Jackson Station; Hamilton, Ontario; L8P 4X2; Canada. Visit the Sianspheric web site at: http://www.sianspheric.com. Visit the Toshack Highway web site at: http://www.toshackhighway.com.